Ah, tis season of winter beers. As the days and nights turn colder, the bite in the air invites us to turn from the lighter, maltier beers of summer to the bigger, bolder, richer beers designed to be sipped by the fire or to be enjoyed with hearty menus, or served at warmer temperatures. For me, when I think of winter beers, I tend to think of stouts, porters and brown ales. While all great styles, I was asked recently the differences between them. I was able to adequately describe the differences between stouts and porters, but ran into some issues describing the differences between porters and brown ales? 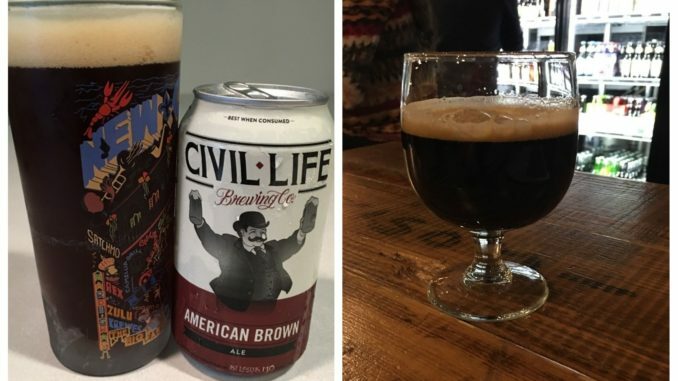 To find a more educated answer, I turned to some of our area’s breweries to get their input and help us better understand how these two styles are linked, and how they differ. Usually a big difference, Brown ales should be sweeter and not have much of a roasted malt flavor. There is more of a difference between Brown ale and Porter than Stout and Porter. The quandary of style is a timeless topic for beer lovers and always the perfect excuse to pop the crown on another bottle. The Beer Judge Certification Program style guidelines have six entries for styles containing the word ‘porter’ or ‘brown,’ as does the Great American Beer Festival style list. The most important difference comes down to where it counts most: flavor. In general, our brewhouse expects anything called a porter to exhibit more pronounced roasted malt bitterness. The malt character in a brown ale tends more toward the caramel or chocolate side of dark malt. But before you even get to drop one, there are clues in the appearance. Porters tend toward the brown-flirting-with-black and opacity. Our brown ale, Three Blind Mice, is a deep chestnut with a strong garnet red tinge. Just another example of how the beautiful complexity of ingredients and processes in brewing open a whole world of sensory bliss. Porters tend to skew darker than Brown Ales. More of a chocolatey leaning-toward roasty character in a Porter. Brown ales are nutty leaning-toward chocolatey. ABV and IBUS tend to be similar, so to me, it’s all about the number of roasted malts that are used, and where the flavor profile lands in that spectrum of malty-nutty-chocolatey-roasty. There’s probably more confusion and ambiguity between Porters & Stouts, to be honest. We are very proud of our Wentzville Brown Ale, and also several of our porters. Having spent some time in New England years ago, I formed my perspective on porters there, in a pretty traditional sense. There certainly can be some overlap in characteristics between an interpretation of a brown and porter, for me, a porter is a little more expressive in mouthfeel and viscosity, less translucent then our brown. A little more earthy and roasty with less hop presence, but definitely close relatives.